Ideal Tax Solution, LLC is serious about keeping their tax resolution clients on the road to financial stability by providing professional tax preparation services to those interested in avoiding the need for tax debt relief in the future. Tax Problems? Personal Or Business, We Are America's Most Trusted. By working with tax relief clients on their tax returns, tax debt resolution companies like Ideal Tax Solution can more thoroughly and knowledgeably chart a client’s course for financial stability. Ideal Tax Solution, LLC is building on its already established and steadily growing client base of satisfied tax resolution customers by prioritizing its financial service offerings to include professional tax return preparation. This move is intended to motivate previous and current tax relief clients to consolidate their financial service needs under the umbrella of an industry leader with broad-based and proven tax liability expertise. Ideal Tax Solution is dedicated to providing tax relief clients with long-term relief strategies to avoid recurrences of financial situations which would again require professional tax help. Their team of tax liability specialists is working hard on getting the word out about the positive benefits of consolidating tax responsibilities under the roof of a single experienced company of tax specialists. These tax professionals bring a developed level of expertise that assist in the establishment and maintenance of a financially stable lifestyle. And, by utilizing the comprehensive services of an experienced tax resolution company, a taxpayer in good standing stands a much better chance of maintaining that status knowing a caring team of tax liability specialists is a simple phone call away in the event an IRS agent develops any kind of interest in changing that status. 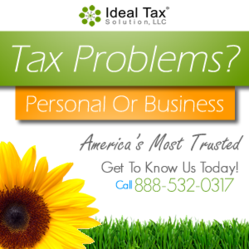 Ideal Tax Solution provides its clients the same unsurpassed customer service and professional tax services, whether during tax return preparation or tax debt resolution, that exemplifies their commitment to helping as many people as possible keep their interaction with the IRS to an absolute minimum. By working with tax relief clients on their tax returns, tax debt resolution companies like Ideal Tax Solution can more thoroughly and knowledgeably chart a client’s course for financial stability. At the very least, by having gone through what can be described as a living nightmare, otherwise known as the IRS collection process, individuals who have resolved – and survived - a tax liability issue, possess an acute understanding of the need for accurate and timely tax preparation and filing. It only makes sense that after enduring the taxing experience of a tax resolution process, even with professional tax help, an individual or business would gravitate to a company like Ideal Tax Solution and their team of tax liability specialists for all tax related issues.